Here are some screenshots of the OOS Alarm in operation, showing the various windows and including some commentary. This is the control window, where the next alarm to occur is displayed, and from where you can edit the alarms to configure the application to your needs. 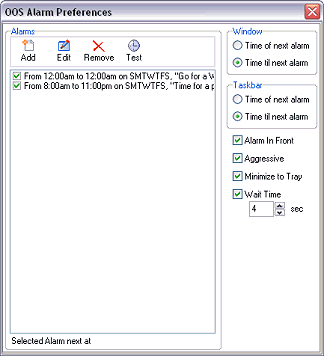 Pressing the main button performs a “reset”, deferring the next scheduled alarm. The other button brings up the settings window. When configuring an alarm, you can choose a visual reminder - a reminder dialog that appears on top of your workspace, reminding you that it is time to take a break. 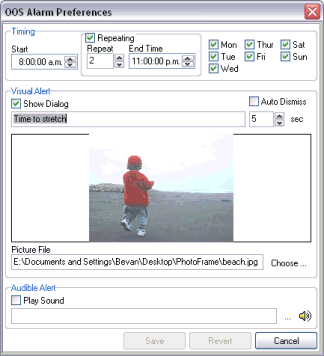 Both the message and picture displayed are configurable. If desired, the AutoDismiss feature allows the Alert window to be automatically closed after a predetermined time. This is particularly useful if you have a prescribed set of stretches to follow - set the autodismiss time to the time you need for all the stretches, and use the onscreen countdown to ensure you do each one for the correct time. This window allows you to configure all of the alarms in the system. Use the buttons above the list of alarms to add a new alarm, or to edit, remove or test any selected alarm. To the right of the dialog are the global options - settings that affect the entire application. You may configure the display on both the control window and the taskbar. Alarm in front configures the alert to appear in front of your current workspace, stealing input focus. If the alarm is also configured as Aggressive, the application will force its way to the front even if you try to switch to another application. Wait Time allows you to configure the minimum time the alert remains on screen - until this amount of time has passed, the close button on the alert will be disabled. Each alarm entered in the system has a specified start time and can optionally repeat until a finishing time. The message for each alarm may be independently configured, as may a picture to display. You may also restrict alarms to only occur on particular days of the week, to reflect your work habits. If you prefer, an alarm may be configured to be audible - playing a sound effect of your choice - and not visible, triggering a reminder sound when required and not intruding on your activities.